This page is a complete guide to all the top wines, wineries, wine makers and appellations in the Southern Rhone Valley. The Southern Rhone Valley is a much larger area than the Northern Rhone. To illustrate that point, close to 95% of all wines in the Rhone come from the Southern Rhone. To give you an idea of the true size of the Southern Rhone Valley, in an average vintage, more than 380 million bottles of wine are produced each year in the Southern Rhone Valley! Of course with an area of that size, you have a wide range of terroirs, micro climates, soils, wines and wine styles. Some of the best wine values in the world can be found in the Southern Rhone Valley! Wines from the Southern Rhone are generally speaking, lighter, sweeter, more open, and more alcoholic than wines from the Northern Rhone. They are much fruitier, expressing red fruit flavors over black fruits, giving you more fresh, sweet, ripe cherries, kirsch, black raspberry and strawberry flavors, often with fresh Provencal herbs, olives and a nice, spicy accent. Wine lovers can enjoy red, white, rosé and sparkling wines, which are all made in the Southern Rhone Valley. There are even a few producers that make sweet wine in the south as well. The wines from the Southern Rhone do not need aging most of the time either, which is a positive benefit for the consumer as well. You can buy them and enjoy their pleasures at will. But the best examples, from the top terroirs make wine that can age, evolve and improve for decades! In the Southern Rhone Valley, the climate is hotter. It rains less here than it does in its neighbor to the north. In the Northern Rhone, the wines are made by blending grapes planted in different soil types and terroirs, as there is only one red wine grape allowed by law to be planted in the regions, Syrah. That is not the case in the Southern Rhone, because there are 15 different allowable wine grapes planted in the South. Similar to the rules in the Northern Rhone, it’s also permitted to blend red and white wine grapes in the Southern Rhone, allowing producers to create wines in a myriad of different styles, with unique characteristics. The most important grape in the Southern Rhone Valley is clearly Grenache. Grenache is widely planted all over the Southern Rhone, but there is one appellation that insures Grenache remains famous all over the world. Chateauneuf du Pape is the undisputed King of the Southern Rhone Valley. Chateauneuf du Pape was granted official appellation status in 1936. Chateauneuf du Pape is unique for its use of 15 different grape varietals. And yes, there are produces that utilize all 15 grapes in their wine! With a terroir that ranges from rocks, stone, sand, limestone and clay soils, there are 3,231 hectares under vine. The vineyards occupy a large area. However, to be considered a wine from Chateauneuf du Pape, the vines must be planted in one of 5 communes, Chateauneuf du Pape, which is the largest area, followed by Orange, Courthezon, Sorgues and Bedarrides. For detailed information on the top producers in the Chateauneuf du Pape appellation, please click on any of the links below on the left side of the page. Even though 15 different grapes are planted in the region, Grenache remains the dominant grape variety. While close to 95% of the wine produced in Chateauneuf du Pape is red wine, 5% of the region makes dry, white Chateauneuf du Pape wine. The myriad of different terroirs and grape varieties help produce great wine in a wide range of styles. Typically, the wines offer notes of fresh cherries, strawberry, kirsch, black pepper, black raspberry, spice, earth and garrigue, which is a melange of all the fresh herbs planted in the region. You can also expect to find character driven wines with styles that range from elegant, lush and lusty, to full bodied, sweet, jammy, rich and concentrated. The wines are often sweet, alcoholic and easy to like. The style of wine is dependent on the producer, vintage, terroir and the grapes used in the blend. 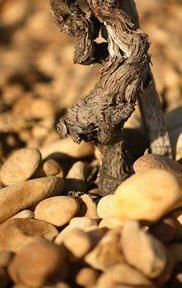 Part of what gives Chateauneuf du Pape its character is the proliferation of old vines in the region. There are a myriad of producers making wine from Grenache vines that 100 years old or older! The old, gnarled vines produce grapes with an intensity of flavor and concentration. Another factor unique and equally important to the region is the mistrals, the name for the powerful, frosty, dry winds that can reach a velocity of more than 60 miles per hour! The mistrals help keep the air and the fruit clean, while removing excess water, insects and disease. Chateauneuf du Pape produces an amazing array of wines in a wide and diverse range of styles. The wines can be modern or traditional. The differences in traditional and modern styled Chateauneuf du Pape can spark endless debates between wine lovers. I love both styles of wine, depending on the wine and wine maker. Much of the difference between traditional and modern, is the ripeness of the grapes, effective yields, amount of stems used and most importantly, the percentage of new oak barrels used in aging the wine. Producers making wines in a more traditional style do not use new oak, preferring to age their wine in older, neutral, massive barrels, cement lined vats or foudres that are widely used in the region. They do not destem the grapes. In other words, they follow the traditional practices of the region. More than just wine, Chateauneuf du Pape has one of the more beautiful wine oriented villages in France, with its narrow, winding, cobble stone streets, outdoor cafes, restaurants, bakeries, ancient ruins of the Pope’s summer home and 360 degree views of the vineyards. Something else to consider should you you visit the region, many of the best estates either sell wine directly to visitors, or they own retail stores in Chateauneuf du Pape, where you can often find older vintages or rare bottling’s that are not available in your local shops. Quite often these wines are sold at more than fair prices! It is definitely worth the visit. While Chateauneuf du Pape is the most important wine producing appellation in the Southern Rhone Valley, there are other quality AOC appellations in the Southern Rhone that are making great wine. In fact, there are 10 recognized appellations in the Southern Rhone producing wine and 5 adjacent communes. The Southern Rhone Valley was not always the popular region it is today. For most of its life, with a few exceptions in Chateauneuf du Pape, until the late 1980’s and 1990’s, there was a general lack of interest in their wines outside of Southwest France. Until relatively recently, most growers sold their harvest to negociants and local co-operatives. Very few wineries had the funds, marketing clout or ability to produce, bottle and sell their own wine. The region has exploded in popularity, quality and price since the late 1990’s. It has to be said that Robert Parker deserves a large of the credit for introducing these beautiful and usually affordable wines to consumers all over the world. Without his tireless efforts and continuous writing about the greatness of theses wines, from top to bottom, worldwide recognition would have taken place at a much slower pace. His efforts cannot be overstated. With this new found, growing popularity for Southern Rhone wines, the growers were finally able to make enough money to invest and reinvest in their properties. The ability to plant new vineyards, reduce yields and harvest riper fruit is only part of the positive changes. As their wines started selling and providing profit to the owners, producers were finally able to build new cellars, ferment at cooler temperature temperatures and vinify on a parcel by parcel basis. Next came the creation and moderate proliferation of single vineyard wines or wines made from specific parcels or barrel selections, especially in Chateauneuf du Pape. More growers continue moving to organic, biodynamic or self sustaining farming techniques, creating healthier, natural soils all the time. None of this would not have been possible without the necessary cash infusion that came with the ability to sell their wines for more than it cost to produce. Cotes du Rhone – Some of the best wine values in the Rhone Valley, if not the entire world come from the Cotes du Rhone. Savvy wine loving consumers looking for early drinking wines with character that won’t break the bank should be taking a serious look at wines from the Cotes du Rhone. It’s reasonable to say that the Cotes du Rhone is the best wine region in the world that provides truly sublime character driven wines at fair prices. The red wines can be fruity, sweet, spicy and packed with ripe, red berries. The wines can be sweet, fruity and easy to drink. If you’re a wine lover seeking value and early drinking pleasure in the wines you buy, you must learn about and discover the Cotes du Rhone. More than just value, Cotes du Rhone wines are for the most part, meant to be enjoyed on release. The majority of Cotes du Rhone wine do not require aging, even if a few wines do improve with time in the cellar. Frankly, they are delicious on release! Cotes du Rhone wines are also extremely food friendly. Cotes du Rhone red wines can be paired with any type of meat, grilled, roasted, braised or stewed. Cotes du Rhone wines make great wine and food matches with beef, pork, game, duck, lamb, sausage, barbecue, grilled and smoked meats, or veal. They are also perfect with a wide variety of soft and hard cheese. White Cotes du Rhone wines are easily paired with any type of fish, shellfish and even sushi, or just enjoy them with cheese. Cotes du Rhone wines are divided into two levels of quality, Cotes du Rhone Villages, which is a higher level of classification and Cotes du Rhone, which is less prestigious, as its terroir is not at the same level as the wines from Cotes du Rhone Villages. To produce wine with either designation, the vineyards must be located in any of the following 18 villages that make up the Cotes du Rhone appellation: Bagnols-sur-Ceze, Chusclan, Laudun, Massif d’Uchaux, Plan de Dieu, Puymeras, Roaix, Rochegude, Rousset-les-Vignes, Sablet, Saint-Gervais, Saint-Maurice-sur-Eygues, Saint-Pantaleon-les-Vignes, Valreas, Visan and Seguret. Seguret is the largest of all the villages. From those 18 villages, there are a total of 171 communes that make up the region. To be a Cotes du Rhone Villages wine, the wine can come from 95 different communes. Generally speaking, Cotes du Rhone appellation laws do not allow for village names to be displayed. However, it is permitted to list the commune, if the commune is one of the 18 permitted communes in the Cotes du Rhone appellation. In late 2016, the Cotes du Rhone Villages added 3 new appellations, Sainte-Cecile, Suze-la-Rousse and Vaison la Romain. The Cotes du Rhone is not a modern creation. The region was originally known as the Coste du Rhone. That changed at some point during the 1800’s. The Cotes du Rhone was officially declared an AOC appellation in 1937. The massive region as you might expect features a myriad of terroirs and soil types that range from rocky hillsides to stony vineyards or land with sand, clay and various rocks, stones and pebbles. Cotes du Rhone is a massive wine region. In fact, it’s the second largest appellation in France. Only Bordeaux has more hectares planted with vines. The entire region is about 44,000 hectares with 31,926 hectares under vine. Close to 100 Million dollars worth of wine is is produced here every year. England is the biggest buyer of Cotes du Rhone wines, followed by France. The Cotes du Rhone is planted for the production of red wine, white wine, rose’ sparkling wine and even sweet dessert wine. Simply put, 89% of all wines are red, 7% is rose’ and 4% of the production is white wine. The dominant red wine grape is Grenache. For the production of white wine, the most important grape varietal is Grenache Blanc. Many producers from Chateauneuf du Pape own vines in the appellation. It’s easy to see why because there are parts of the Cotes du Rhone that have almost identical terroirs found in Chateauneuf du Pape. In fact, there are vineyards in the Cotes du Rhone that are either just across the road from Chateauneuf or only a single row of vines away. The Cotes du Rhone is the largest appellation in the Southern Rhone Valley. Close to half of all wines produced in the area are from this appellation. The region produces red wine, white wine and rose’ wine. Look for wines from Janasse, Rayas, Vidal Fleury, Chapoutier, Beaucastel, Clos du Caillou, Roche, Vieille Julienne, Michel Gassier, Clos des Papes, Vieux Telegraph, Usseglio, Feraud-Brunel and Perrin et Fils. The Best Vintages of the Southern Rhone are: 2016, 2015, 2012, 2010, 2009, 2007, 2005, 2001, 2000, 1998, 1990, 1989, 1985, 1981 and 1978. I left off 2003 because while there are some stunning wines produced in that extremely hot, dry year, the vintage lacks consistency. It’s also important to keep in mind, most wines from the Southern Rhone in the top appellations, like Chateauneuf du Pape that are meant for aging, are most often at their best during their first 5 to 12 years of life. While some wines, especially at the best vineyards in the top years can age much longer, the majority of Chateauneuf du Pape wines drink well young and should be consumed by their 15th birthday. Still, it’s important to know which years were for the best for Chateauneuf du Pape. As for the majority of Southern Rhone Valley wines not from Chateauneuf du Pape, most of those wines which come from the following appellations should be consumed before they are 3 to 8 years of age. Gigondas is a fairly young appellation that was only granted AOC status in 1971. Prior to 1971, Gigondas was considered to be a part of the Cotes du Rhone. There are 1,233 hectares of vines in the appellation. Located just north east of Chateauneuf du Pape, there are three main terroirs in Gigondas; gravel and clay soils, found in the flat areas, the bottom of slopes, which offers more gravel and sand with less clay and the hillsides which have made from rocks, limestone and clay. Over the years, the wines of Gigondas have gotten better and better. Grenache is the most important grape in the appellation. In fact the AOC rules state to be a wine of Gigondas, all wines must be at least 50% Grenache. The wines can be similar to those found in Chateauneuf du Pape, but they are more rustic and perhaps a touch less complex. Gigondas is a terrific region that makes serious wines of quality, and most of the time, they are extremely well priced. In the past, white wine was allowed to made in the appellation, that is not the case today as only red wine and rose’ are allowed to be produced in the Gigondas appellation. In fact, 99% of the wine produced in Gigondas is red wine. Look for wines from Saint Cosme, Santa Duc, St. Gayan, St. Damien and Perrin et Fils. Lirac The appellation of Lirac was created in 1947. In Lirac, at least 80% of the wines produced are red. Perhaps 10% of the wine made is white wine and the remainder of the production is rose’. Lirac has 715 hectares of vines. To produce wine from the appellation, the vineyards must be located in Lirac, Roquemaure, Saint-Genies-de-Comolas or Saint-Laurent-des-Arbres. The rules of the Lirac appellation state that all wines are blends and that Grenache must be at least 40% of a vineyards plantings. Lirac is at the far southern end of the Rhone Valley. Lirac is on the border that separates the southern Rhone from Languedoc-Roussillon. 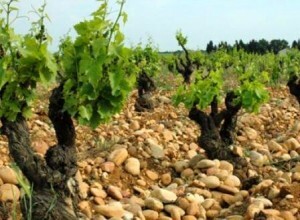 The best terroir can be similar to some of the rocky, gravel soils found in Chateauneuf du Pape. Look for wines from Domaine de la Mordoree, Grand Veneur, Duseigneur and Mont Redon. Rasteau was finally granted AOC status in 2010 for its dry red wine. Before that, since 1944, wineries seeking to use the Rasteau AOC were only allowed to produce Vin Doux Naturel. Rasteau is situated just north and east of Chateauneuf du Pape. The entire appellation is only 47 hectares and was previously a part of the Cotes du Rhone. The appellation only permits the production of red wine and their unique, sweet, red fortified wine, Vin Doux Naturel Rasteau, which is produced from the Muscat grape. The red wines are popular and defined by their high percentages of Mourvedre in the blend. Look for wines from Domaine les Aphillanthes, Domaine Les Grand Bois, Feraud-Brunel and Beau Mistral. Tavel was created in 1936. There are 902 hectares under vine. The Tavel appellation only allows for the production of rose’ wine. The wines can be made from any of the 9 authorized grape varieties. By appellation law, all wines must be blends and no wine can consist of more than 60% of any single grape variety. The terroir of Tavel is mostly rocks, sand, limestone or clay soils. There are numerous wine lovers that swear Tavel produces the world’s finest examples of rose’. In Tavel, rose’ is either produced by placing the grapes in vats and allowing the weight of the fruit to lightly crush the berries, where they steep for one of two days. Or the wine can be produced by using the saigner method, which is also know as bleeding of the tanks, where the juice closest to the cap that has been in contact with the skin, (Giving the wine color) is bled off. The majority of wine makers in Tavel use the first method. Look for wines from Domaine de la Mordoree, Lafond Roc Epine and Guigal. Vacqueyras was a part of the Cotes du Rhone until 1990, when it was granted AOC status. 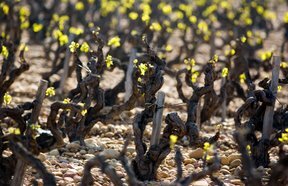 Vacqueyras has 1,406 hectares under vine. The vineyards must be planted in the commune of either Sarrians or Vacqueyras, which places the appellation slightly east of Chateauneuf du Pape. The vast majority of wine produced in Vacqueyras is red wine. In fact, close to 95% of the region is devoted to red wine, 4% to rose’ and 1% is white wine. Located due south of Gigondas, Vacqueyras can be a great source of value wine from the Southern Rhone valley. The best terroirs are rock, sand and clay soils. Grenache is the dominant grape, followed by Mourvedre, Syrah and Cinsault. Look for wines from Santa Duc, Domaine la Garrigue, Chateau des Tours, Domaine du Colombier, La Colline, Famile Perrin and Alain Jaume. Beaumes des Venise became an appellation for the production of red wine in 2005. The tiny appellation consists of 27 hectares of vines. That makes Beaumes des Venise the smallest appellation in the Rhone Valley that produces red wine. That region takes its name from it’s natural setting as Beaume is translated into cave or grotto and Beaumes de Venise is close to a series of grotto’s and caves placed in neighboring hillsides. The region also includes the small villages of Lafare, La Roque Alric and Suzette in the appellation. The village is quite attractive and it still houses one of the oldest ancient Roman Churches, the Notre Dame d’Aubune chapel, with its ancient tower built in the 9th century. The location of Beaumes des Venise places it not far from Vacqueyras, and just directly east of Chateauneuf du Pape, close to Orange and the Rhone river. AOC law demands that all wines must be blends and that Grenache is a minimum of 50% of the blend, with at least the next 25% of the blend coming from Syrah. Appellation rules further state that vineyards must be planted with at least 80% of their vines devoted to Grenache and Syrah. Other red wine grapes allowed in the Southern Rhone can be used as part for the blend White wine grapes are allowed for the use in up to 10% of the blend for wines from Beaumes des Venise. The terroir is mostly sand, loam and limestone soils. Previously, the wines were sold as Cotes du Rhone Villages Beaumes-de-Venise. Look for wines from Domaine des Bernardins and Vidal Fleury. Muscat de Beaumes des Venise The area was granted appellation status in 1945. Muscat is the only allowable grape in the appellation. The region of Muscat de Beaumes des Venise is known for producing the unique, sweet, fortified dessert wine, Muscat de Beaumes de Venise. Dry red wine from the appellation is sold as Cotes du Rhone. Look for wines from Vidal Fleury, Alain Ignace, Jaboulet, Chapoutier and Domaine du Grand Montmirail. Bandol was awarded official AOC appellation status in 1941. Bandol has 1,550 hectares under vine. Located not far from Marseille and Cassis, and about an hour drive from Chateauneuf du Pape. Bandolier is the only French appellation where the majority of plantings are devoted to Mourvedre. The terroir of Bandol is mostly hillside plantings with a terroir of limestone, rocks and sandy marl soils. Bandol appellation law requires that all wines be produced using a minimum of 50% Mourvedre in the blend. Bandol also produces a large amount of rose’ wine, as well as dry white wine. Look for wine from Domaine Bastide, Chateau de Pibarnon, Domaine d’Olivette, Barthes and Tempier. Costieres de Nimes is one of the oldest wine producing regions in France as it was first planted by the ancient Romans. Nimes, and the neighboring city of Orange have some of the greatest Roman ruins in France. Prior to becoming its own appellation, it was a part of the Languedoc region. At the time, it was known as Costieres du Gard. The appellation was created in 1986 and three years later, in 1989, the region changed its name to Costieres de Nimes. In 2004, due to the character of the wine, the appellation was granted the status of being part of the Southern Rhone Valley. Because Nimes was cultivated by the ancient Romans, there are numerous ancient ruins all over the place in this area. In fact, the appellation of Nimes pays hommage to this with their logo. The logo, which features a crocodile chained to a palm tree is similar to one of the logos used by the ancient Romans that occupied the Nimes area more than 2,000 years ago. The Costieres de Nimes appellation is located at the southern tip of the Southern Rhone Valley. Situated southwest of Avignon, Costieres de Nimes is the furthest south of any appellation in the Rhone Valley. The terroir is mostly rocks, sand, clay and shale soils. Over 95% of the wines from Costieres de Nimes are red, which are divided as follows; 51% is red wine, 41% is rose’ and 8% of the wine produced is white wine. Syrah, Carignan, Mourvedre and Grenache are the most important grapes, followed by Cinsault. There are old vines in the region, with some vineyards having vines more than 100 years of age! Look for wines from Michel Gassier, Chateau de Nages, Terre des Chardons, L’Emitage Chateau Beaubois and Domaine de Poulvarel. Cote du Luberon is located at the tip of the south, eastern portion of the Southern Rhone Valley. The appellation was officially created in 1988. Cote de Luberon consists of 36 separate communes and more than 3,310 hectares of vines. The appellation is located in the far eastern part of the Southern Rhone Valley. 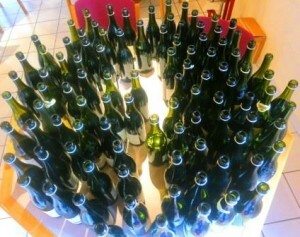 In the Cote du Luberon, the wines produced are divided as follows; 53% Rose’, 26% Red wine and 21% white wine. The terroir is a mixture of sand, limestone and clay soils. Vineyards must be planted to a minimum of 60% Grenache and Syrah. In Cote du Luberon, for the production of red wine, Grenache and Syrah are the two key grapes, followed by Mourvedre, Cinsault, Carignan, Counoise, Gamay and Pinot Noir. White wines are produced from Grenache Blanc, Clairette, Ugni Blanc, Marsanne and Roussanne. Look for wines from Tardieu Laurent, Marrenon Luberon and Domaine de Fontenille. Cote de Ventoux was officially named an appellation in 1973. In 1990, Cote de Ventoux was awarded the status of a Biosphere Reserve by Unesco. Located in the south east sector of the Rhone valley, and almost bordering Chateauneuf du Pape, Cote de Ventoux was first planted by the ancient Romans. The Cote de Ventoux has 5,873 hectares under vine. The terroir is mostly rocks and limestone soil. Most of the vineyards here are close to the slopes of Mont Ventoux, which is probably the only appellation in the Southern Rhone to experience the sight of snow in the colder, winter months. The cooler climate producers lighter, fresher, less alcoholic wines than most Southern Rhone appellations. The small, picturesque village of Ventoux is the home to one of the best cheese stores in the Southern Rhone, Fromagerie du Comtat, which is the perfect place to end your day after a day of wine tasting. Cote de Ventoux produces 60% red wine, 36% rose’ wine and 4% white wine. Grenache is the most important red wine grape in the region and Clairette rules the roost for white wine. Look for wines from Domaine de Fondreche, Domaine Mur Mur Lum, Domaine des Anges, Xavier Vins and Chateau Pesquie, especially the Pesquie Ventoux Quintessence and Pesquie Terrasses. Cote de Vivarais is situated in the northern part of the Southern Rhone, giving it a bit of the best of both worlds. Cote de Vivarais became an appellation in 1999. There are 321 hectares of vines in the appellation. Most of the wine from Cote de Vivarais is red wine, which is divided as follows; 53% is red wine, 41% is rose’ and 6% is white wine. Grenache and Grenache Blanc are the two key grapes. The terroir is mostly limestone and marl soils. Look for wines from Domaine Gallety. Grignan-les-Adhemar was previously known as Tricistan. That changed in late 2011 because the region had the misfortune of sharing the same name as the nuclear plant. When it was known as Tricistan, the region was made an official AOC appellation in 1973. The massive Grignan-les-Adhemar appellation has 1361 hectares under vine. It also holds the title for the northern most appellation in the Southern Rhone. The production of the appellation, which is mostly drunk up by locals is split to 66% red wine, 23% rose’ and 11% white wine. Look for wines from Delas Freres, Chateau Bizard, Andre Aubert and LePlan-Vermeersch. Cotes de Provence is the first region in France where the ancient Romans planted vines. In fact, the region was known as Provincia Nostra by the Romans, which can be translated from Latin into “Our Province,” which is where the area takes its name from. The region was granted AOC status in 1993. Cotes de Provence is a massive appellation with 20,250 hectares under vine. Most of the wine produced here is rose’ which is usually made from Grenache, Cinsaut, Syrah, Mourvedre, along with the native grapes of the region, Tibouren and Vermentino. The climate is warm, sunny and dry, similar to what you find in the Southern Rhone. In fact, Provence also experiences the same fierce, cold, mistral winds that blast through Chateauneuf du Pape. Look for wines from Miravel, Richeaume and du Dragon. Coteaux d’Aix-en-Provence with its 4,000 hectares of vines was granted AOC status in 1985. The region produces red wine, white wine and rose’ wine. It is one of the few regions in the Rhone Valley that allow plantings of Cabernet Sauvignon. The white wines are made from blends normally associated with the region, along with Vermentino, which is also known as Rolle. Trevallon is an interesting winery in the appellation, as they do not make a rose’. Instead, they focus on producing wines with Cabernet Sauvignon and Syrah. They also make a smattering of dry white wine. These wines are sold under the IGP designation of Alpilles. Look for wines from Chapoutier, des Beats, Mas de Gourgonnier, Bargemone and Trevallon. Les Baux-de-Provence was granted AOC status in 1995. Appellation laws demand that all wines from Les Baux-de-Provence are blends and that no two specific grape varieties can make up more than 90% of the blend from wines bearing the Les Baux-de-Provence appellation. Aside from the typical Southern Rhone Grape varietals, you can also find plantings of Cabernet Sauvignon, similar to those found in Coteaux d’Aix-en-Provence. Les Baux-de-Provence produces red wine, white wine and rose’. Look for wines from Mas de Gourgonnier. Coteaux Varois was granted AOC status in 1993. Previously, it was considered to be a part of the Cotes de Provence. 85% of all wines produced in Coteaux Varois are rose,’ followed dry red wine and white wine. Due to its cooler terroir, Coteaux Varois is the last region in Provence to harvest. Picking often takes place in November. With its unusually cool climate, Burgundy producers have been experimenting with Pinot Noir plantings in the Coteaux Varois appellation. Look for wines from Chateau Routas, Chateau La Calisse and Chateau des Annibals. Vinsobres became a recognized appellation in 2006. Prior to that, it was considered as part of the Cotes du Rhone. Located in the northern part of the southern Rhone, Vinsobres has 441 hectares under vine. AOC laws state that all wines must contain a minimum of 50% Grenache and no less than 25% Syrah and/or Mourvedre in the blend. Only red wine is produced in the Vinsobres appellation. Look for wines from Pierre Amadieu, Constant Duquesnoy and Beaucastel Perrin et Fils. Duche d’Uzes was granted AOC status in 2012. Even though Duche d’Uzes is the newest appellation in the Rhone Valley, it has one of the longest histories in the Rhone as it is highly probable that the ancient Greeks planted vines here in about 500 BC. In Duche d’Uzes, there are 282 hectares under vine. The Duche d’Uzes appellation is on the far western part of the Southern Rhone Valley. All wines from Duche d’Uzes must be produced from blends. 62% of the wines are red, 19% are white wine and 19% are rose’ from the region. The terroir is mostly rocks, sandstone and limestone soils. Look for wines from Volcae Duche d’Uzes. Cairanne was officially granted appellation status in 2016. Previously, it was part of the Cotes du Rhone appellation. Starting in 1953, the wines were sold as Cotes du Rhone Cairanne. In 1967, designation was added for Cotes du Rhone Villages Cairanne status. The appellation of Cairanne is 956 hectares and produces 94% red wine, 5% white wine and 1% rose’ wine. About 40 different growers are active in the region. Cairanne has a terroir of white clay with chalk, red clay and silt soils. The region has old vines. In fact, more than half the vines are over 30 years of age. The rules of the Cairanne appellation require for all red wines to include no less than 50% Grenache in the blend, followed by at least 20% of Mourvedre and, or Syrah. The remaining portion of the blend can be from any other allowable grape varieties. The same rules apply for rose’s. Grenache Blanc is the most important white wine grape in the region. Cairanne is an appellation that provides great, early drinking wines with character for the money. Look for wines from Domaine Roche, Daniel and Denis Alary, Domaine Boisson and Les Grand Bios. Clairette de Bellegarde was created as an official appellation in 1949. Clairette de Bellegarde is probably the smallest appellation in all of France. The entire region is roughly 40 hectares! And of those 40 hectares, there are currently close to 16 hectares planted with vines in the region. At most, there are 15 active growers in Clairette de Bellegarde. Clairette Blanc is the only grape allowed for cultivation in the appellation. Perforce only white wines are produced here. The area is located at the extreme southern tip of the Rhone Valley, not far from Nimes and Arles. The cooler terroir is mostly rocks and clay soils. Look for wines from Mas Carlot, Clos de Boutets and Terre des Chardons. Clairette de Die was created as an appellation in 1942. There are 1,500 hectares planted in the appellation. The Clairette de Die region only allows for the planting of as you might have guessed from the name of the appellation, Clairette, for use in its dry white wines. The appellation is also known for the production of sparkling wine that can be made from Muscat Blanc and Clairette. Look for wine from Achard Vincent. Many growers in the region provide their grapes to the local co-operative. Cremant de Die became an official AOC designated wine region in 1993. The only wine allowed to be produced here is sparkling wine. The wines are made in the traditional Champagne method which requires two fermentation, an initial alcoholic fermentation and a secondary fermentation that takes place in bottle. The three main grapes planted in Cremant de Die are Clairette, Aligote and Muscat. Cremant de Die and St. Peray in the Northern Rhone are the only two appellations in the Rhone Valley that allow the production of sparkling wine. Several growers in the Cremant de Die appellation sell their harvest to the co-operative.